A self-professed purveyor of ‘beautiful electronic cinematic melodies’, Infinite Scale is the solo project of musician, producer and DJ Harmi Palda. 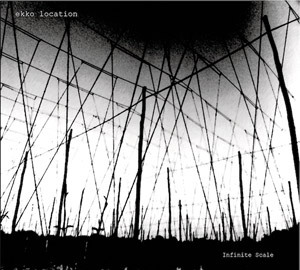 Originally set up in 1997, Infinite Scale has since had a string of releases on Toytronic, Boltfish and Rednetic, yet Ekko Location is only his second full length record, and the follow up to Ad Infinitum, published two years ago on Rednetic. Very much like its predecessor, Ekko Location is a fine example of edgy melodic electronica, but here, Palda moves closer to the classic sound of Detroit, especially in the first half of the album, where tracks such as Out Of The Blue, Captured or Mobile Lives denote a move toward much more upbeat and linear territories than previously heard from Infinite Scale. Ekko Location opens with the steady beat of Out Of The Blue, upon which Palda layers lush and warm electronic textures. The structure of the piece is kept to a minimal, but its linear groove gives it a surprisingly motorik feel. This is also partly the case on Mobiles Lives, but here, the bass line becomes the primary driving force behind the track to give it strong dance floor credentials. The pace slows down a tad with Captured, but here again Palda creates a very spacious and lush setting where electronics are layered into slow progressive forms. However, the makeup of the piece is more complex and refined, with melodic components tightly woven into its fabric to give it a slightly psychedelic feel. After that, Palda returns to the dreamier atmospheric sound he has made his own with pieces such as Live Feed, Somewhere Inside, In Your Mind or When Power Runs Dry displaying particularly exquisite fluid structures, evocative melodies and rich textures. In fact, following the three opening pieces, which appeared to set Ekko Location on a set orbit, this initially could appear at first as a step back, but it is undeniably where Palda is most at ease, at least on records, and while the pace occasionally picks up again, if often just for fleeting moments, the mood is resolutely more subtle and laid back for the rest of the album. At its most ambient, Ekko Location remains a captivating offering, where every sound has its place and contributes to the overall aspect of the record. On Witness or closing piece Learjets And Tricycles, warm analog sounds, carried by restrained rhythmic patterns, bubble up to the surface to build up into some extremely effective atmospheric moments. Palda’s use of smooth, rich and complex soundscapes contributes to Ekko Location feeling at once contrasted and consistent. More importantly, his compositions are so intricate that it is impossible to grasp them entirely in one listen, meaning that repeat visits have a tendency to reveal new textures, sounds or melodies, adding to the overall experience of this record.